Eighty-one years after America witnessed the Scopes trial over the teaching of evolution in public schools, the debate between science and religion continues. In this book scholars from a variety of disciplines-sociology, history, science, and theology-provide new insights into the contemporary dialogue as well as some perspective suggestions for delineating the responsibilities of both the scientific and religious spheres. Why does the tension between science and religion continue? How have those tensions changed during the past one hundred years? How have those tensions impacted the public debate about so-called "intelligent design" as a scientific alternative to evolution? With wit and wisdom the authors address the conflict from its philosophical roots to its manifestations within American culture. In doing so, they take an important step toward creating a society that reconciles scientific inquiry with the human spirit. 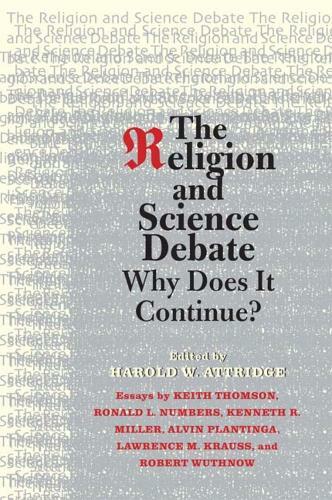 This book, which marks the one hundredth anniversary of The Terry Lecture Series, offers a unique perspective for anyone interested in the debate between science and religion in America. "This is an unusually well-integrated roundtable on a very timely subject." --Owen Gingerich, Harvard-Smithsonian Center for Astrophysics, author of "God's Universe"